Philips Cinema 21:9 58PFL9955H review | What Hi-Fi? First-generation products that might be regarded as ahead of their time don't always hit the ground running. It's fair to say that Philips' first attempt at a 21:9 TV wasn't without its issues. It'll be interesting to see what the second generation 21:9, or to give its full name, the Cinema 21:9 Platinum Edition, has in store for us. This year's model is larger – up from 56 to 58 inches. To accommodate the aspect ratio, resolution is once again slightly higher than Full HD (2560x1080p compared to 1920x1080). The big news for this model is that it's also a 3D set, and you get two pairs of active shutter glasses thrown in for free. Connectivity is as thorough as you'd expect on a £4000 TV. There are four HDMI inputs including one that's ARC-compatible (Audio Return Channel) – useful if you'd like to listen to the sound from the TV's built-in tuner through a compatible amp. Twin USB inputs can handle a variety of digital media codecs, and the set also boasts both wired and wireless internet connectivity. Philips doesn't offer the breadth of online content some if its rivals manage (no BBC iPlayer for example) but you can surf the web, using the remote control as a rather awkward compromise to an old-fashioned mouse and keyboard. No Philips set would be complete without an overload of picture processing technologies, and this is a tweaker's dream. The 21:9 uses the company's Perfect Pixel HD engine. The LED backlight is a full array design and directly dimmable. Persevere with set-up and the results can be pretty spectacular. Watching a movie in 21:9 without the black bars top and bottom gives movies a more cinematic, involving and entertaining look and feel. Considering their age, the recently remastered Back To The Future Blu-rays look stunning. The Philips extracts a superb level of detail; the edges of the DeLorean are sharply drawn while Marty and Doc's ‘futuristic' costumes display wonderful textures and natural colours. Switch to a more modern disc, such as Star Trek, and the Philips paints space with fantastically deep, rich blacks. And then, as Kirk, Sulu and Olsen do their skydive to disable the Romulan drill, there's an impressive contrast between the darkness of space and the bright, punchy fight sequence atop the drill platform. And yet, for all its processing prowess, the Philips has trouble presenting varying degrees of motion in a smooth, natural manner. Flicker and motion smearing make regular appearances – and removing one just seems to encourage the other. 3D content looks splendid (although you can't convert 2D to 3D). Cloudy With a Chance of Meatballs appears attractive and inviting: the jaw-dropping cheeseburger-shower scene shows good depth and cohesion. The Philips isn't without crosstalk issues, but it isn't a million miles away from the likes of Sony and Panasonic. 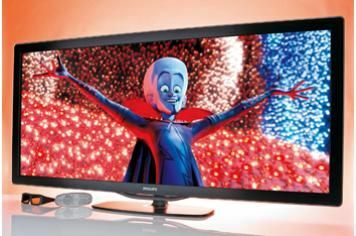 With DVDs, considering the TV has to do a significant amount of scaling to match its resolution, the Philips does a good job. We'd recommend viewing high-definition content where possible, but the 21:9 is solid. But, as was the case with the first generation 21:9 TV, there are a couple of caveats that have to be taken into account even when watching movies. It's hard to get a picture that isn't cropped or stretched, albeit in a minor way. This leads to a slight loss of picture at the top and bottom or to the left and right edge of the image. Perhaps a bigger gripe is that the set still struggles with a film that's predominantly subtitled. Because the Philips removes the black bars you'd see on a traditional 16:9 set, you lose part of the subtitles too. Switch to the Cinema 21:9 subtitle-shift mode and the set simply moves the picture up from below, resulting in a squashed image. Alternatively you have to buy one of Philips' Blu-ray players to get round the problem. Not exactly helpful. You're better off, too, watching off-air broadcasts in the 16:9 aspect ratio and making do with thick black bars on either side of the screen. On the whole, terrestrial TV looks passable enough, although the lack of an HD tuner is baffling on a set like this. There's a hint of on-screen noise to Freeview, but images are generally stable and colours appear natural. It was always going to be a tricky task to reach perfection on its second attempt. This new 21:9 set is cheaper and very much improved in some areas, but Philips needs to iron out a few more flaws before it can be considered a true flatscreen siren.